While congregational singing was not new with the Reformation, the Reformation brought it to new heights and general use. One of the key individuals in doing this was Johann Walter (1496-1570). He is the one we commemorate today. This commemoration is one of the new ones on our Liturgical Calendar. Johann Walter was Martin Luther’s musical advisor. He helped Luther with the part of the reformation that had to do with the church’s music, liturgy, and hymns. 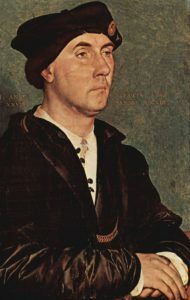 The year 1524 was very important for Walter and his contributions to the Lutheran Church and, through the Lutheran Church, Christianity in general. First, Walter published a very important hymnbook, which was used in the church, school, and home. Prior to this, hymnals were for church choirs only. It was a book of musical arrangements of hymns, mainly for choirs, and included 35 hymns, 23 of them by Luther himself, arranged to be sung in 3, 4, or 5 part harmony. With Luther’s input Walter prepared this book. One of the innovations in this hymnal came with the four-part harmony hymns. In some of them the melody was carried by the top voice, which today is the common way hymns are written. Walter continued to add hymns to this first protestant hymnal for the remainder of his life. The second important thing Walter did in the year 1524 was to help Luther prepare a new liturgy. It wasn’t really new. But at that time, the church service was sung only in the Latin language-which most people did not know-and things contrary to Scripture had invaded the church service, which gave the impression that the main focus of worship was our doing things for God rather than of God’s giving things to us. Luther was preparing a service that would (a) be in German (the language the people could understand), and (b) get rid of the errors. In 1524 Walter spent three weeks in Luther’s home while helping him write this liturgy. He said Luther showed himself to be very capable in composing the music. However, the final version also showed Walter’s influence as he improved Luther’s musical settings for the liturgy. Walter was a layman, but he was a good Lutheran theologian. After Luther’s death Walter remained a strong Lutheran in doctrine and worship. As an orphan he experienced the sadness of growing up without parents, but he helped bring happiness to many through the music he wrote to the glory of God. He also wrote the words to some hymns. His hymn “The Bridegroom Soon Will Call Us” (1552) was the first one devoted specifically to the glories of eternal life. He gave it the title “A Beautiful Spiritual and Christian Song of the Last Day and Eternal Life.” Originally it had 33 verses! (I told you singing was important to Lutherans.) It is hymn 514 in the Lutheran Service Book, but we have only four verses. Sadly I can’t find a recording of it on YouTube. Verse four truly reflects the heart of a musician’s view of heaven. The Giver of the feast. O Lord God, through the life, death, and resurrection of Your Son, Jesus Christ, and by the power of the Holy Spirit, the revelation of Your salvation mystery is now revealed and made known to all the nations. Grant that this mystery of salvation, as confessed by Johann in word and music, and all those who now rest from their labors, continue to guide Your Church on earth as we wait for the day when You come from heaven one last time and usher in the new creation; through Jesus Christ, our Lord, who lives and reigns with You and the Holy Spirit, one God, now and forever. Amen. Trivia: An asteroid has been named after Johann Walter.